This moist, delicious Pumpkin Cranberry Bread is perfect for fall and Thanksgiving celebrations. 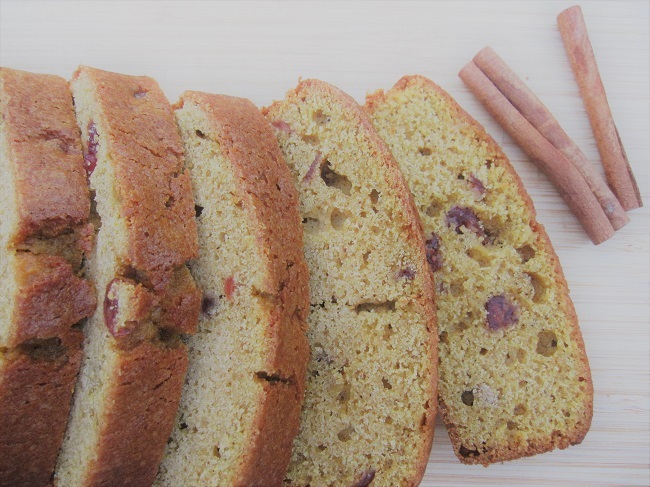 The recipe is wonderful with raisins and nuts in place of the dried cranberries, or plain too. Preheat oven to 350 degrees Fahrenheit. Grease and flour two 9 x 5 x 2 1/2″ bread pans, set aside. In medium bowl, sift together flour, baking powder, baking soda, cinnamon, nutmeg, cloves, and salt. Set dry mixture aside. In large bowl, stir together sugar, oil, and eggs. Add pumpkin puree and mix well. Gradually add dry ingredient mixture and stir well after each addition. Fold in dried cranberries. Evenly divide batter into two loaf pans and bake for 55 – 60 minutes. Bread is done when toothpick inserted in center comes out clean. This site is a participant in the Amazon Services LLC Associates Program, an affiliate advertising program designed to provide a means for The New Homesteader’s Almanac to earn fees by linking to Amazon.com and affiliated sites. You will not pay any extra for these products and we earn a small commission to help support this free website. Be advised that Amazon places cookies on your browser. This will definitely be on my baking list for this week! It looks delicious.